Compusoft Engineering provides analysis and design services for light-weight/longspan structures - in particular tension membrane structures. The process is undertaken using expert knowledge, extensive worldwide experience and customised non-linear finite element membrane software. Design services extend from concept design solutions through to membrane patterning. Configurations can be tailored to meet the most demanding of client requirements. Compusoft Engineering are experts in the analysis and design of light-weight/longspan membrane structures and have designed over 100 fabric structures worldwide to all major design codes. Compusoft Engineering provides independent guidance for the development of light-weight/longspan membrane schemes, including shapes and support systems. Compusoft Engineering provides stress analysis of the fabric membrane and support system using specialist large displacement non-linear finite element programs. Global code compliant design and detailing of the fabric membrane system, including fabric, cables, membrane plates, and support structure. Compusoft Engineering has the ability to undertake the production of computer generated fabric patterns for the design shape. 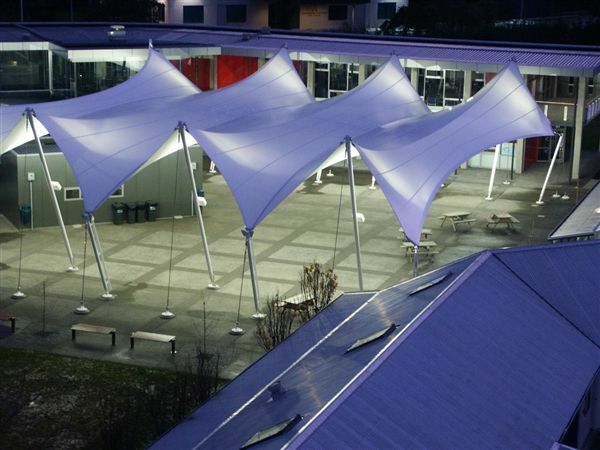 Tension membrane structures combine elegant forms with cost efficiency, performance and function. Tension membrane structures provide a unique engineering challenge. The engineer must design a structure whose form is determined not only by the vision of the Architect but also the forces within the fabric. Tension membrane structures work in a manner that is totally different from conventional structures. Specialist knowledge is required to evaluate and efficiently distribute the large tension loads generated by the structural form. Combining the structure and cladding into one has proved cost competitive with conventional roofing while additionally providing reduced noise and exceptional lighting characteristics. In addition, the lightweight nature of tension membrane structures, as opposed to conventional roofs, allows rapid erection and relocation. In terms of earthquake engineering, the lower mass means potential cost savings to the overall seismic stability of the supporting structure.